TheArmenianKitchen.com : The real secrets of Armenian cooking are kept by women who are happy to share! The real secrets of Armenian cooking are kept by women who are happy to share! Most people go to bookstores searching for a great novel. Me? I head right to the cookbook section. If, however, you’re looking for down-home, tried and true recipes - Armenian, American, or otherwise - the place to look is in any cookbook compiled by a Women’s Guild rather than the glossy, over-priced publications featuring a “food celebrity." Don‘t get me wrong: I love ALL cookbooks. However, I’ve turned my attention lately from bookstore cookbooks, to the lesser-known, yet highly desirable, cookbooks from church guilds and school organizations. In order to raise money for the school, the students and I decided to create a Faculty Cookbook. We asked faculty, staff, and family members to submit their favorite recipes to be included in our cookbook project. We received an overwhelming response, and put together quite a nice little cookbook - if I do say so myself! Besides the high school cookbook, I own Women’s Guild cookbooks from St. David Armenian Church, Boca Raton, Florida; St. Mary Armenian Church, Livingston, New Jersey; St. Sarkis Armenian Church, Charlotte, North Carolina, and eventually a soon-to-be-published cookbook from the Women’s Guild at St. Leon Armenian Church, Fairlawn, New Jersey. 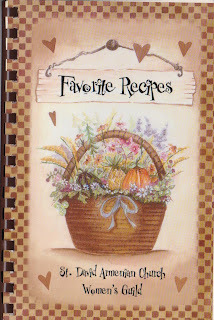 The recipes found on these pages are the real, everyday recipes that feed our hearts and souls- the comfort foods that make us recall sweet moments at the dinner table with family and friends. If any of you have a Woman’s Guild or school cookbook you’d like to share, simply write a comment in the appropriate place in this blog, or email me: robyn@thearmeniankitchen.com. This is a marvelous item! It ought to start a whole movement; in fact its own spot here on the Armenian Kitchen.